How is a foam mattress different than a traditional innerspring, and what are the different types of foam mattress? This is the most commonly asked questions about foam mattresses. Let’s delve into the fundamentals of foam mattresses as well as their benefits and potential drawbacks. Foam mattresses are made of a variety of foam material. The major types of foam mattress are polyurethane foam, memory foam, and foam latex. The basic difference between a traditional and a foam mattress is that foam mattresses do not utilize an inner-spring system (which is what makes them bouncy). Memory Foam: Memory foam consists mainly of polyurethane (also referred to ask viscoelastic polyurethane). This type of foam has openings within the foam structure which allows for airflow which is what allows for a cooler sleep experience, and the ‘molding’ feature which is often touted. This is the same type of foam you may find in your sofa—but the memory foam has a much higher density. Memory Foam Toppers: As the name suggests a memory foam topper is a relatively thin layer of memory foam which is laid on top of a traditional mattress to provide some of the benefits of a full memory foam mattress. Foam Latex: Foam latex is similar to polyurethane foam, but is made of either a natural latex material derived form the hevea-brasilienis (rubber) tree, or a man-made equivalent. In many cases foam latex touts being natural, but make sure that the latex foam mattress you purchase for this fact is actually natural latex. Traditional Memory Foam: The traditional memory foam mattress consists of several layers of polyurethane foam with varying densities which is designed to mold to the sleeper’s body, and create a ‘cradled’ feeling. Gel MemoryFoam: Gel memory foam takes the traditional memory foam and infuses gel within the foam material to allow for improved cooling capabilities. In some instances it may also provide greater pressure relief. There are three density varieties for foam mattresses. Each level of density provides a different level of support. Low-Density Memory Foam: Low-density memory foam weighs 3 pounds per cubic foot of foam material. Low-density foam feels softer than higher densities, and allows helps sleepers sink more quickly into the foam. Low-density foam is less durable. Medium-Density Memory Foam: Medium-density memory foam weighs 4-5 pounds per cubic food of foam material. Medium-density foam provides a good balance between comfort and durability. High-Density Memory Foam: Any foam with a weight of equal or greater than 6 pounds per cubic foot of foam material is considered high-density foam. High-density foam is very durable, but will take longer to allow the sleeper to sink into the material. Memory foam, or rather foam mattresses in general, range in thickness from around 9 inches to as thick as 13 (and sometimes 14) inches. A well made 9 inch thick foam mattress will provide a better sleep experience than a badly made 13 inch thick foam mattress. Generally, if the person sleeping on the mattress is of average weight/BMI, then a well-made 9 inch mattress will work perfectly fine. For those with a heavier constitution a thicker mattress may be recommended. Luckily, most foam mattress manufacturers offer in home trials so you can try out before making a final decision. Pressure Point Relief & Spine Alignment: Foam mattresses provide a more comfortable sleep experience by reducing pressure points due to the lack of inner-springs. It also helps with spine alignment because it allows the body to sink into the mattress material. Relief & Prevention of Back Pain: Due to the unique type of support that memory foam provides, it helps relieve and prevent back pain. Of course, a foam mattress is no substitute for proper medial advice if you are experiencing chronic back pain. Less Motion Transfer: Due to the intrinsic qualities of the foam material, it transfers much less of the motion from one part of the mattress to another. This means that when one person moves and shifts on the bed, the person next to him will be much less likely to be disturbed by the motion transfer. Reduction & Prevention of Dust Mites: The foam material is not a hospitable environment for dust mites, so foam mattresses are much less likely to harbor this undesirable guest. Hypoallergenic: The foam material does not provide a good environment for allergens to thrive, so foam mattresses are by nature hypoallergenic. Unusual Chemical Smell for a Few Days: Due to the manufacturing process, foam mattresses have a chemical smell which usually passes within a few days. Ideally, a new foam mattress should be aired out for 24 hours before use. 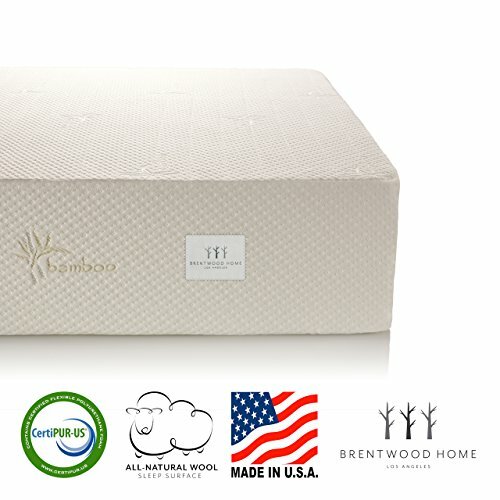 Not Suitable for Infant Beds: Because foam mattresses mold to the body, they are not a good fit for use in infant beds as they could be a suffocation hazard. An all-natural layer of wool provides you with a clean and healthy sleep surface. Wool wicks away moisture and is an excellent temperature regulator that keeps you cool in the summer and warm in the winter.